The Sea Rescue Sled recovery system works best in conjunction with the standard dan buoy normally used as a first line of sighting of overboard personnel. Push “MOB” on the yacht’s chartplotter, if you have one. Throw the dan buoy over the side. Deploy the Sea Rescue Sled by removing it from its bag, pulling the tab to instantly inflate, and throwing the sled over the side. The painter will stream out of the bag. Stop the vessel after the MOB has picked up the painter. Check that the MOB has reached and boarded the sled. Drop the mainsail and place the vessel in a HOVE TO position. Clip the designated halyard to the lee rail. Pull the sled towards the vessel and onto the lee side. Clip the strop line onto the halyard and use the painter to tie the sled loosely to the rail. Winch up the sled until it’s level with the top rail. Bring the sled on board and lower it to the deck. Monitor the MOB’s condition. Get them downstairs, into dry clothes and then into a sleeping bag or similar. Make a cup of tea. This helps with chilling and shock. Watch closely for signs of hypothermia (exposure) and contact emergency services if the MOB’s condition deteriorates. 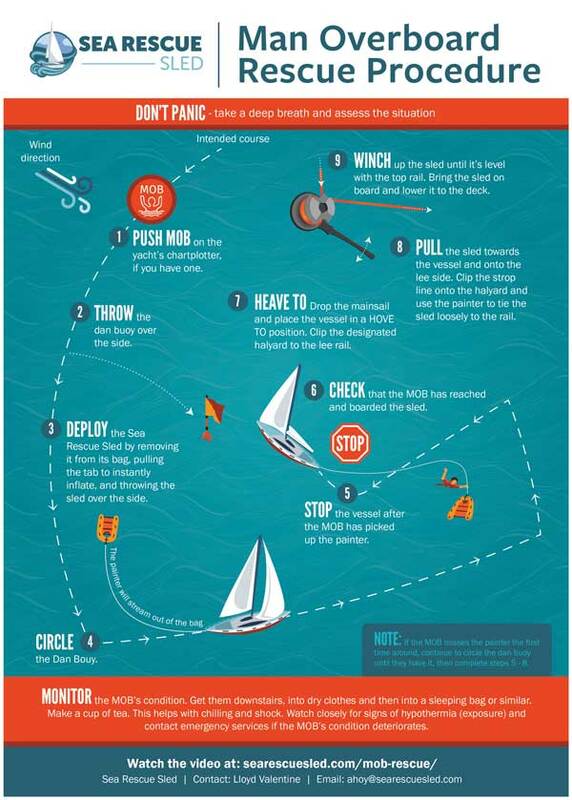 Safeguard your own life and the the lives of your crew at sea. Order a Sea Rescue Sled today.